It's always sad when someone leaves the Digit-al Dozen, we are all such a close little group. In honor of the amazing Leslie the Digit-al Dozen have decided to do some tribute manicures! Leslie always creates nail art that makes me gasp, she is one of the ladies that always inspires me to try new things and to better myself. When I came to pick a manicure to recreate I struggled because I wanted to do it justice. I decided to re-create this Love and Heartbreak manicure . Yeah it's not as good as the master's but I am pretty happy with the result. I have used Barry M Cyan Blue and then Funky Fingers Sand and Stilettos. I then used some white acrylic paint to define my half moons and heart-accent. 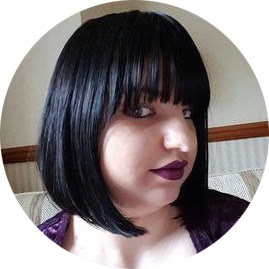 I am really sad to see Leslie go, but it's been fab having her in the Digit-al Dozen and I know that we will continue to talk and I will still stalk follow her blog for more nail polish ideas. Thanks for taking this journey with me Leslie I wish you all the best with what comes next! so cute Kerrie - I love it!